Interested Job Aspirants who are ready to apply for NTPC Limited 2018 Notification must possess the below-given Eligibility Details. Selected candidates will get Diploma Trainee: Rs. 15,500 to Rs. 34,500 /- ITI Trainee: Rs. 11,500 to Rs. 26,000/- by the Recruiting Organization. NTPC Recruitment 2018 – Apply Online for Diploma Engineer Posts: National Thermal Power Corporation Limited (NTPC) has advertised a notification for the recruitment of 362 posts of Diploma Engineer vacancies. Eligible candidates can apply online from 18-04-2018 to 09-05-2018. 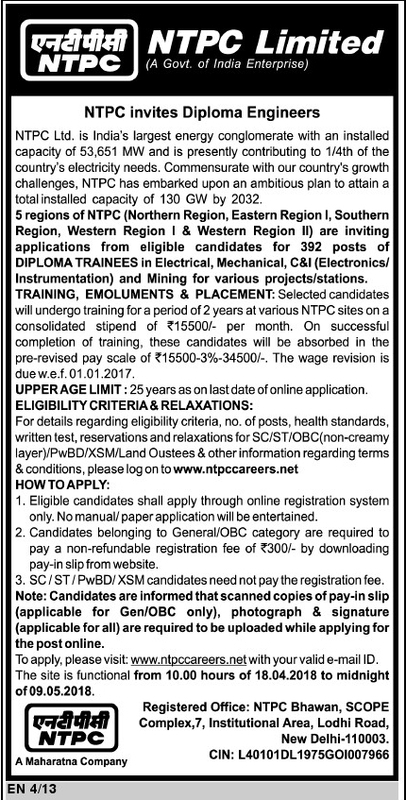 Other details like age limit, educational qualification, selection process & how to apply for NTPC Jobs are given below. Selected candidates will get Rs. 15500-34500/- by the Recruiting Organization. Selection of Candidates for Diploma Engineer posts will be done as per following stages- Eligible candidates will be selected on the basis of performance in Online Exam I, Online Exam II & Skill Test. First of all, Open Official Website i.e., www.ntpccareers.net or Below Mentioned link from Careers99.com Website.